Perfect Pants update: pink version made, loved, and worn to school today; retro jeans version muddied and in the laundry as we speak. Photos soon! In the meantime, I’m working on a stack of quilt projects. I’ve been sewing on the Bee bee rows I’ve gotten so far, plus making more blocks for the Your Second (Modern) Quilt class sample–right now it’s a foundation-pieced block and it’s lovely–and planning the quilting lines on both the Man Woobie and the 1600 quilt I made at the Sewing Retreat (I’ll be quilting the latter of those live in Montgomery on March 31 at the Festival of Alabama Fiber Arts–details soon!). In the 28 remaining minutes of my day, I’ve also stumbled across some acrylic templates that I just had to have. It started with the Modern Quilting Bee I’m doing this year with some of my very favorite ladies. This month was my month to plan the quilt, and I’ve asked them all to make the Retro Flowers blocks for my quilt, in a red-and-white version inspired by the Infinite Variety installation last summer. 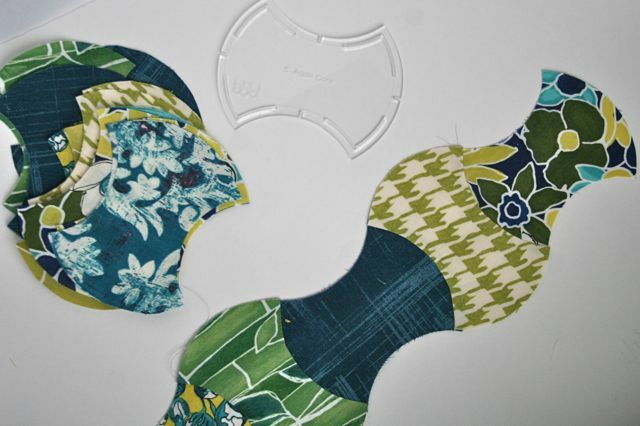 When I bought the Retro Flowers pattern, I saw there were also templates available through Tabslot on Etsy–along with a pile of templates for other quilt projects. Naturally, I got pretty much all of them. The Apple Core was the one that begged to be cut out first. 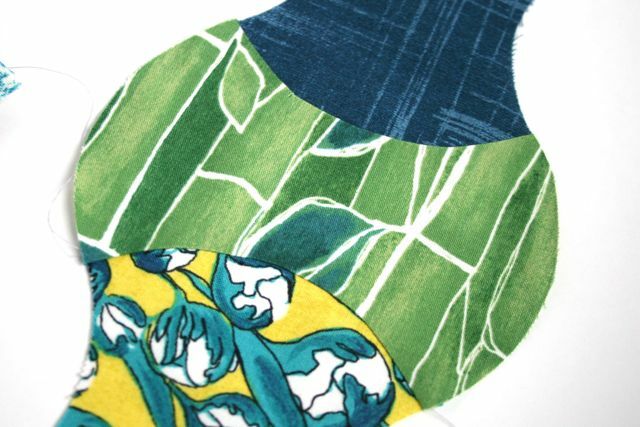 I love the curved edges, which is weird a little, since in most of my life and decor I lean toward 90-degree angles and straight lines, but in clothing and sewing I love me a curved seam. This Apple Core screamed at me, mostly because I love the way the patchwork goes together: short end to long side, one core at a time, to make a row, then sew the rows together using another curved seam. 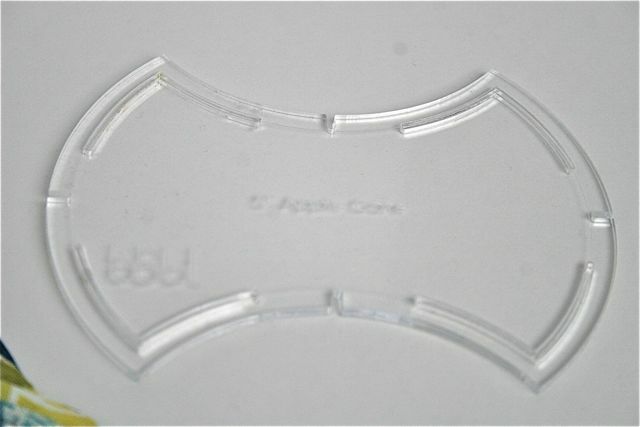 Each template is a heavy-duty clear acrylic, perfect for using with a rotary cutter. I folded my fat quarters into fourths, then cut through all four layers at a time when making my Apple Core pieces. I used my 28mm rotary cutter, based on the logic that the smaller blade would make it around those curves more smoothly and consistently. These are not fast seams to sew, sadly. You don’t whip through an Apple Core quilt. But they’re super satisfying, the way the curves come together and make a slowly undulating edge along each side of the row that will be sewn to the next row. I think I’ll end up making these fabrics staggered as I work across the quilt, so that each print stairsteps itself, rather than having the quilt top be scrappy. I have an awful lot of scrappy projects going right now, and I’m craving something that has a larger-scale organization to it. That’s such a big part of what appeals to me about quilting, I think: that I can flit between multiple projects without feeling flaky, because so many of them take time and are created in stages anyway, so it’s simple to do a little here and a little there as the project works itself on toward completion. I mean, foundation piecing is fidgety work, and can be tedious–the results are completely worth it, and every block is a stunner, but I don’t know that I could make an entire foundation-pieced quilt top in one go. It’s fun to break it up with other ideas and shapes, like mixing in a little Apple Core now and then. Of course, the unfortunate side effect is that I have far fewer finished projects to share with you. I’ll have to factor that into my equation at some point. But maybe not today. You know, until you said that, I didn’t really think about it being A LOT. I mean, it is, but the nice thing is that I don’t feel pressured to finish any of it *right now* since they’re all quilts and I expect them to take longer than a pair of pants or something. Man, isn’t quilting GREAT? Creativity AND lack of pressure! Where did you buy your acrylic template? I want one just like it. I’m 90% certain they’re from TabSlot on Etsy–but I don’t see them on her shop now. I wonder if she’d do some custom for you?? Hope that helps!